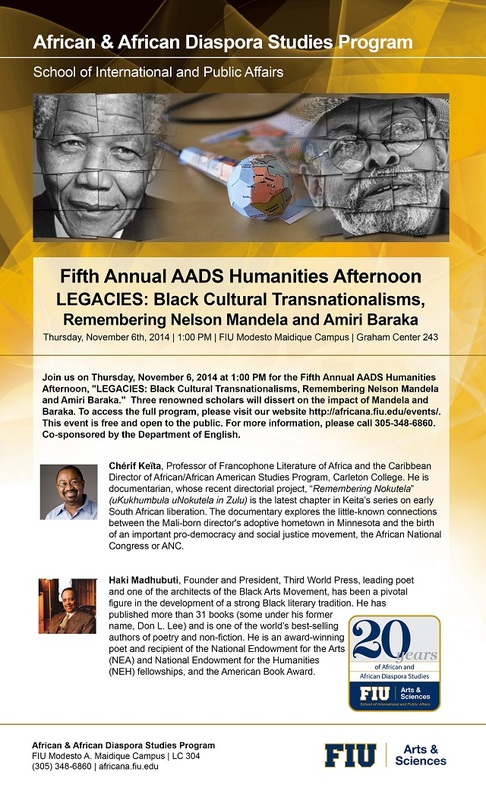 Our theme this year invites scholars to reflectively pay homage to the legacies of Nelson Mandela and Amiri Baraka, two great public intellectual giants for the fields of African and African Diaspora Studies who passed away last year. Their dedication and commitment to full black enfranchisement and eradication of racism were unwavering. As we organize this event, we assert that the humanities—the pursuit of what it means to be fully human—are deeply embedded within the struggles for equal rights and social justice. The conversations around black cultural nationalisms in South Africa and the US we hope to foster are intended to engender cross-disciplinary and fertile discussions about the way legacies of Nelson Mandela and Amiri Baraka have shaped the past, inform the present, and continue to be relevant for the crafting of more just, inclusive, and humane societies. This event is organized by AADS and is co-sponsored by the Department of English. "Searching the Grey area of the South African Liberation History"
Presentation of Chérif Keïta’s documentary: "Ukukhumbula uNokutela," "Remembering Nokutela"
"The Malcolm X Legacy: What It Means to Be Black and Literate in the 21st Century and the Importance of Art in the Maturation of All People"
Reception to celebrate the speakers and AADS' award of the Title VI-UISFL Grant.